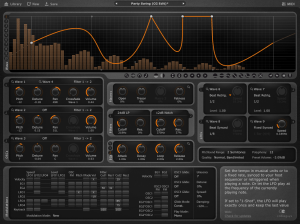 They continue to add to their stable of instruments with the release of Curve 2, a subtractive synth. The award winning synth has a great dark grey and orange design, and features 3 oscillators, 4 LFO’s and 3 Envelopes. There are two lovely sounding filters, with variable pole and band pass settings, with simple cutoff and resonance. The oscillators can be tuned and panned, the envelopes are ADSR affairs, and the level and speed of the LFO’s are tweak-able. So far so good. The top third of Curve’s GUI is a window displaying a bank of 10 waveforms. This is the foundation for Curve’s audio creation. for each sound you create, you have access to a bank of 10 waveforms, that you draw yourself. Drawing the waveforms is as simple as click and drag, single and double click to place up to 40 nodes that directly or indirectly influence the waveform. These waveforms can be layered 2 per oscillator and blended. Behind the waveform is a simple bar graphic that displays the harmonic partials of the sound. It looks great, and is useful to visualize the effect the dragging and clicking is having. I liked the different ways you could choose to influence the waveforms depending on how many times you click. One click, creates a node that just influences the waveform like aural gravity, causing the wave to curve around it. A double click causes the waveform to pass directly through the node created. 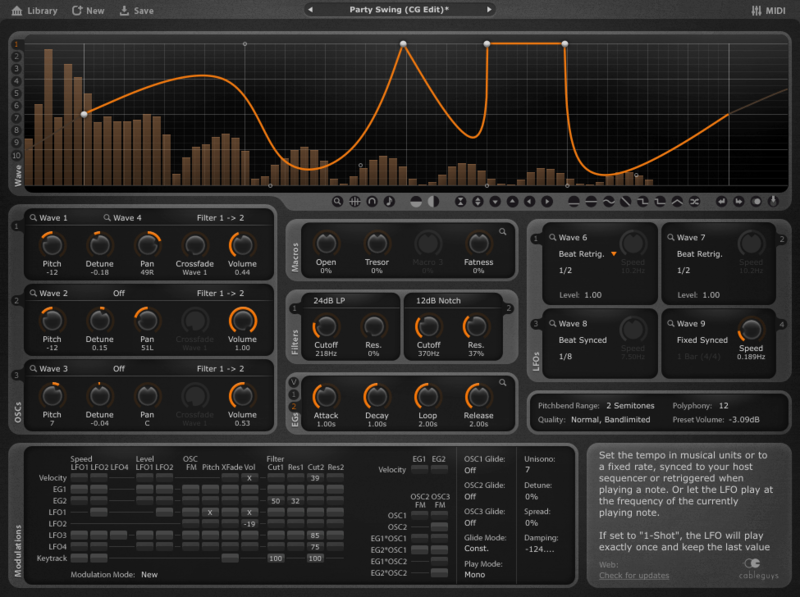 The whole thing reminded me of a slightly more intuitive version of Native Instruments’ Absynth envelope setup. At the bottom of the waveform window are a selection of controls that enable a great deal of flexibility. There are several basic waveforms available at the click of a button. Using the tools provided also enables you to align to a grid, both with tempo and tuning, which presents the opportunity for creating rhythmic gated sounds, wobble effects, arpeggiated sequences, and so on. If you’re not sure how to get started, as I would say this is not really a beginner’s synth, Cableguys walk you through the basics of creating a good preset on their site. These waveforms that you create are also used for the 4 LFO’s, selected from a drop down menu. Already the potential of using the created waveforms for both the oscillators and the LFO’s is massive. There are also slightly different waveform editors for the envelopes. As with the other waveforms, these have many potential nodes, which allows for very complex envelope forms. One envelope is for volume, the other two are modular – as with the LFO’s you can assign them to different places. Each envelope has a loop function as well as regular attack decay and release. I really liked the immediacy of the macro section. You can quickly select up to 8 parameters per macro knob to affect. You just click and drag to the parameter you wish to use, select how much it will affect that parameter, and you’re done. That is the simplest way I’ve seen Macro editing done. Very ergonomic! In fact, the midi control is as useful and intuitive; once you’ve sorted your macros out, a simple click of the midi button on the top right of the window, a selection of the macro, then twiddle a knob/fader on your controller. Done. Brilliant. This effective midi control applies to almost every parameter of the synth. True, since Ableton it is getting to be standard nowadays, but it is nice to see and use. The waveform editing presents many possibilities. The modulation matrix is where you can route your waveform creations of the LFOs and the envelopes to various locations on the synth. The matrix is simple. Source on the X grid, destination on the Y. Find the intersection you want to affect, and click and drag to increase or decrease the interaction. Needless to say, this expands the possibilities of the synth enormously. There were a couple of practical things that stood out about Curve 2, in the way that it is packaged, and portrayed. – I liked the demo version – you can have one instance in full, but with no preset saving. This really gives you flexibility to try the product out, without the annoying white noise or clicks that other demos have. – The community presets. This is a great idea involving the Curve2 community. If you create presets, you can upload them to the cablguys server, and other users can download them directly within the software as presets on their machine. And there are already A LOT of presets, from users and renowned sound designers alike. You can filter them by instrument type, and by rating. It’s a great sign of a company that are really being creative in not only the architecture of soft synthesis, but in the connection of software to the wider community as well. Here’s a link to a video demonstrating waveform sequencing that can be done on the Curve. It’s quite a good display of the sound quality of Curve2. I really enjoyed the sounds of Curve 2. It seemed on first impression to be aimed at the dubstep market, with heavy use of wobble and other big bass sounds in the marketing videos, and many of the endorsements. But I feel that although that is a definite strength with the immense flexibility of the waveform editing, that is just a tiny corner of what this synth can do. Although I don’t feel like this is a great synth for the true beginner, if you enjoy sound design at any level beyond that, this synth is a serious contender for creating sounds that run the gamut from blazing synths to complex evolving soundscapes. Just browsing the constantly growing selection of presets from the community is testament to that. There are a couple of things that I would have liked in addition to the already great setup. I would have loved a couple of effects, purely for inspirations sake. Well placed effects can really supercharge inspiration, and really increase the scope of the sound world you’re working with. The lazy side of me would love a bank of preset waveforms perhaps a little more developed from the basic waves available in the toolbox. How cool would it be to have access to a community preset bank where you could upload an emulation of your minimoog sawtooth wave! Looking through the presets I found a couple that were like that. Maybe if it’s just another filter in the community preset bank alongside the current selection highlighting the fact that it’s just a basic waveform, not a synth preset per se. Really well done Cableguys. This product really competes hard against the established sound design synths out there. This is a sound designer’s dream synth. If you’re looking for a quick access go-to preset synth, I think others would do a better job. If you’re really wanting to get deep into the sound, and create from the bottom up – there’s not much out there any better! Fairly steep learning curve. No pun intended.